Frida Kahlo (6 July 1907 – 13 July 1954) was a Mexican painter. 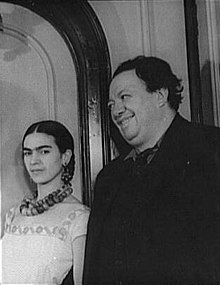 She was married to cubist painter Diego Rivera. Quote in a letter to Ella Wolfe, "Wednesday 13," 1938, as cited in Frida: A Biography of Frida Kahlo by Hayden Herrera (1983) ISBN 0-06-091127-1 , p. 197. In a footnote (p.467), Herrera writes that Kahlo had heard this joke from her friend, the poet José Frías. Until always and forever. Now in 1944. After all the hours lived through. The vectors continue in their original direction. Nothing stops them. With no more knowledge than live emotion. With no other wish than to go on until they meet. Slowly. With great unease, but with the certainty that all is guided by the "golden section". There is cellular arrangement. There is movement. There is light. All centers are the same. Folly doesn’t exist. We are the same as we were and as we will be. Not counting on idiotic destiny. I am a poor little deer. In 1946 Frida painted 'The Little Deer', her self-portrait as a wounded stag; her health took an irreversible turn for the worse, then. His [Diego Rivera's] supposed mythomania is in direct relation to his tremendous imagination. That is to say, he is as much of a liar as the poets or as the children who have not yet been turned into idiots by school or mothers. I have heard him tell all kinds of lies: from the most innocent, to the most complicated stories about people whom his imagination combined in a fantastic situation or actions, always with a great sense of humor and a marvelous critical sense; but I have never heard him say a single stupid or banal lie. Lying, or playing at lying, he unmasks many people, he learns the interior mechanism of others, who are much more ingenuously liars than he, and the most curious thing about the supposed lies of Diego, is that in the long and short of it, those who are involved in the imaginary combination become angry, not because of the lie, but because of the truth contained in the lie, that always comes to the surface. 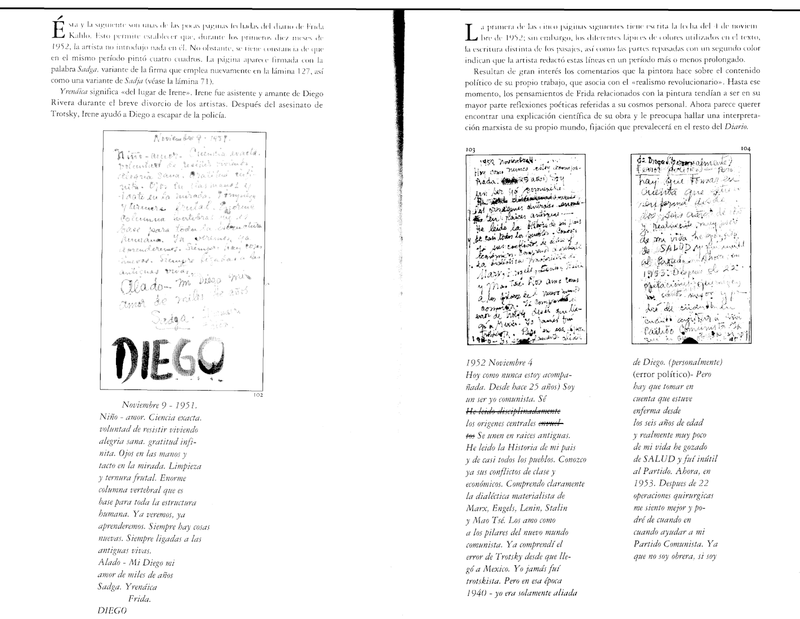 Frida's quote On Diego Rivera, in 'Portrait of Diego' [Retrato de Diego] (22 January 1949), first published in Hoy (Mexico City) and posthumously (17 July 1955) in Novedades (Mexico City): "México en la Cultura"
I have suffered two grave accidents in my life, one in which a streetcar knocked me down... The other accident is Diego. Since Trotsky came to Mexico I have understood his error. I was never a Trotskyist. Si tengo alas para volar. It's true I'm here, and I'm just as strange as you. This is usually attributed to the Diary of Frida Kahlo, which does not contain the quotation. 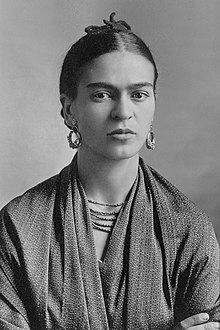 As explained on the Quote Investigator website, a postcard containing the quotation and a portion of a photo of Frida Kahlo was sent anonymously in 2008 to the PostSecret website, which posted a photo of the postcard, but the probable author was Becky Martin (Rebecca Katherine Martin). The actual quotation is: I used to think I was the strangest person in the world but then I thought, there are so many people in the world, there must be someone just like me who feels bizarre and flawed in the same ways I do. I would imagine her, and imagine that she must be out there thinking of me too. Well, I hope that if you are out there you read this and know that yes, it’s true I’m here, and I’m just as strange as you. A very common theme in [Kahlo's] work was fertility, fertility, fertility.. .In one painting, she draws pelvic bones. In another, a uterus is directly drawn. Another is showing the fetus. She's telling us what she's thinking about, but she never put her finger on what exactly was wrong. The art of Frida Kahlo is a ribbon around a bomb. If I were a painter, I'd be Frida Kahlo. She painted what she painted because she had to, because she was passionate about it. She didn't care at all if people bought her paintings. As she said, she painted her reality.